Spend the night on board with a selection of special Eid packages that include complimentary access to Laguna Water Park at La Mer for two people with shuttle bus service, breakfast, brunch (inclusive of soft beverages) and/or dinner on board. Half board is priced at Dhs888 and full board at Dhs999 (excluding taxes and tourism dirham). Children up to the age of six stay and eat for free. For those looking to go all out, the ‘On Board’ package includes a night’s stay with breakfast, the Funfair Feast (brunch) with house beverages and the Razzle & Dazzle Dinner Show with beverages and complimentary Laguna Water Park access for two, all priced at Dhs2,250 per couple. Call 04-5268888, e-mail dining@qe2.com or visit qe2.com/offers. From June 14 to September 14, 2018, avail Grand Hyatt Abu Dhabi’s summer offer of 20% discount on Hyatt Daily Rate. The newly-opened hotel is home to a culinary journey through various cuisines. First to launch, Verso welcomes families, immersing them into the Italian way of life, by experiencing authentic and distinctive flavours, in a colourful, lively ambient setting. For a sumptuous afternoon tea or a light treat, the Pearl Lounge offers an elegant and relaxing venue, reflecting the region’s pearl centered heritage throughout the design, from the breath-taking chandeliers to the intricate side tables. Call +971 2 510 1234 or visit abudhabi.grand.hyatt.com. Celebrate Eid Al Fitr with a festival full of culinary experiences and entertainment activities for the young and young-at-heart, such as live music, water gym, water polo, Pilates and more. Take advantage of Rixos The Palm’s special Eid offer of 30% savings on the ‘ultra-all-inclusive’ package, which gives you unlimited access to all restaurants, bars, daily minibar service, non-motorized watersports, and more. Over the Eid weekend, from June 15 – 16, the resort’s Turkish restaurant A La Turca will host a two-day feast running from 7am – 4pm. The restaurant will be offering a laid-back breakfast followed by a grand buffet in the afternoon to delight in the comfortable indoor seating or the outdoor terrace looking out to the pool. Eid brunch is priced from Dhs315 per person on both days. Call +971 4 457 5555 or visit thepalmdubai.rixos.com. If you’re a GCC resident, you’re in luck! This beachside hotel is offering a 15% discount to all residents on stay rates, which can be used in turn as credit to spend on food, beverage or other services during the day at the hotel. Call 04 399 4141 or visit westinminaseyahi.com. Treat your loved ones to a perfect getaway at Fairmont Bab Al Bahr. Experience the ideal package for a fun-filled vacation and enjoy 50% off the second room. This Eid family offer includes one night accommodation in a luxuriously appointed guest room, 50% off second room, of the same room category for the same stay, complimentary breakfast for two adults on each room, complimentary meals for kids under 12 years old when dining with their parents at CuiScene Restaurant during the stay, early check-in (from 12 noon) and late check-out (until 5pm), a variety of kids activities, plus complimentary valet parking, WIFI and access to the pool and private beach. Rates start from AED 700* per night for the first room and AED 350* (50% off the first room rate per night for the second room – based on Fairmont Rooms), subject to availability. Second room is for children or adults. Call 02 654 3333. The recently opened Saadiyat Rotana Resort and Villas will be offering a 25% discount on best available rates until September 2, 2018. What’s best is that when you spend Dhs699 at Sim Sim, Si, and Hamilton’s restaurants in Saadiyat Rotana, you’ll receive a complimentary night stay at one of Rotana UAE hotels and resorts. The modern resort boasts a regal, Arabic presence across 327 rooms and six diverse dining options with sea views and a large array of leisure facilities. This luxury desert resort encapsulates the heritage and culture of the desert environment and each of the 42 private suites highlight Al Maha’s original Bedouin style architecture and natural surroundings. With the ‘Wander More’ offerings, Marriott international’s loyalty program members booking at Al Maha between now and September 30, 2018 can experience the Bedouin way of life with a 30% discount across suite stay, dining and the Timeless Spa. Non-members can avail a 20% discount. Call 04 832 9900. Exclusively for UAE residents, Fairmont Dubai is offering a 20% discount off the best available rate on stays, which include complimentary benefits like buffet breakfast. Residents can also avail 15% discount off food and beverages outlets by Fairmont Dubai, 10% discount on spa treatments and complimentary valet parking. You can also get an additional 10% off your stay as a member of Fairmont President’s Club, when you book directly. Visit fairmont.com/dubai/. As the warm summer months arrive, Alila Jabal Akhdar invites guests to escape the sweltering desert heat and cherish the crystal-clear skies, invigorating fresh air and crisp breezes of the Hajar mountain range. 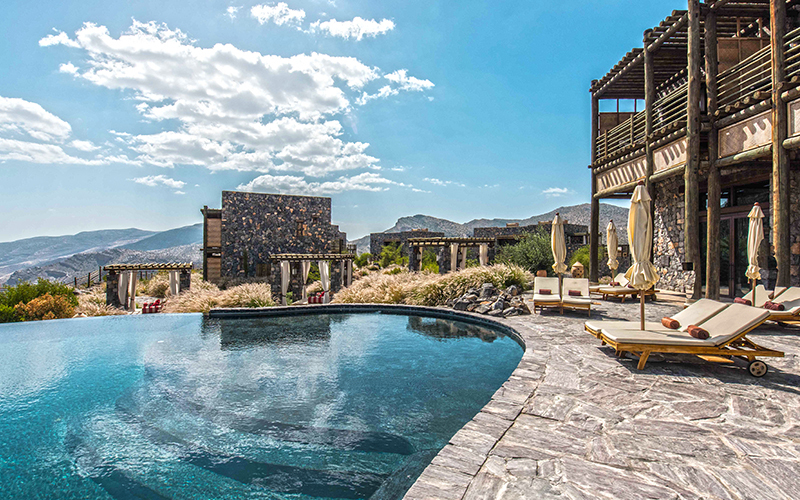 Positioned 2,000 meters above sea level, Alila Jabal Akhdar is always 15 degrees cooler during the summer months. The ‘15 Degrees Cooler Package’ is available until September 30, 2018, starting from Dhs 1,097 a night plus taxes. Start and end the day with a calming sunrise and sunset yoga session on the deck, unwind at Spa Alila with bespoke and unique wellness treatments designed to revitalise mind, body and soul or tuck in to an array of delicacies and refreshing drinks, at the award-winning Juniper restaurant. Call +968 25 344200 or visit alilahotels.com/jabalakhdar. Celebrate Eid Al Fitr with a family staycation at The St. Regis Abu Dhabi, located at the vibrant heart of Abu Dhabi with a 200 metre stretch of beach, overlooking the waters of the Nation Riviera Beach Club. The Eid al-Fitr staycation offer is priced at Dhs650 for a superior room with complimentary upgrade to a sea view room with Dhs200 restaurant dining credit, breakfast and 4pm late checkout. To stay in a signature suite, prices are from Dhs1,200 and include Dhs500 restaurant dining credit, breakfast and 4pm late checkout. There’s also an offer to book one room and save 50% on the second room. E-mail reservations.abudhabi@stregis.com or call +971 2 694 4666.